Our ability to measure the cognitive components of complex decision-making across species has greatly facilitated our understanding of its neurobiological mechanisms. One task in particular, reversal learning, has proven valuable in assessing the inhibitory processes that are central to executive control. Reversal learning measures the ability to actively suppress reward-related responding and to disengage from ongoing behavior, phenomena that are biologically and descriptively related to impulsivity and compulsivity. 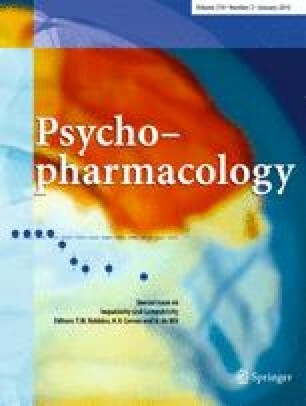 Consequently, reversal learning could index vulnerability for disorders characterized by impulsivity such as proclivity for initial substance abuse as well as the compulsive aspects of dependence. Though we describe common variants and similar tasks, we pay particular attention to discrimination reversal learning, its supporting neural circuitry, neuropharmacology and genetic determinants. We also review the utility of this task in measuring impulsivity and compulsivity in addictions. We restrict our review to instrumental, reward-related reversal learning studies as they are most germane to addiction. The research reviewed here suggests that discrimination reversal learning may be used as a diagnostic tool for investigating the neural mechanisms that mediate impulsive and compulsive aspects of pathological reward-seeking and -taking behaviors. Two interrelated mechanisms are posited for the neuroadaptations in addiction that often translate to poor reversal learning: frontocorticostriatal circuitry dysregulation and poor dopamine (D2 receptor) modulation of this circuitry. These data suggest new approaches to targeting inhibitory control mechanisms in addictions. This work was supported by Public Health Service grants 1SC2MH087974 (Izquierdo), the NIH MBRS program at CSULA (grant R25 GM61331) and by the Consortium for Neuropsychiatric Phenomics at UCLA (UL1-DE019580 and RL1-MH083270). Additional support was derived from PHS grants P20-DA022539 and P50-MH077248 (Jentsch).